Hurricane Irma damaged the ferry landings in September 2017. As of today (January 28, 2019) the ferry is not operating. Local groups are lobbying to get the ferry service restored. 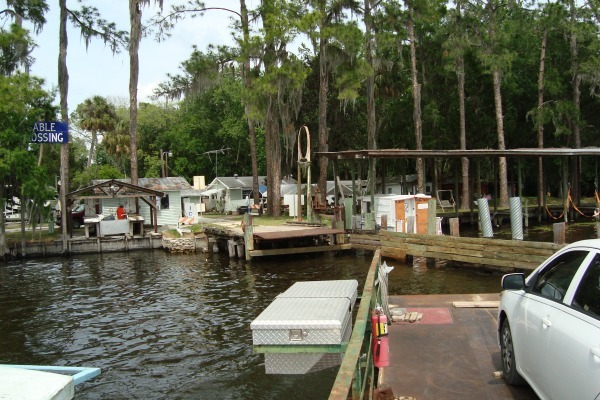 We suggest you call Gateway Fish Camp at 386-467-2411 before making the trip. 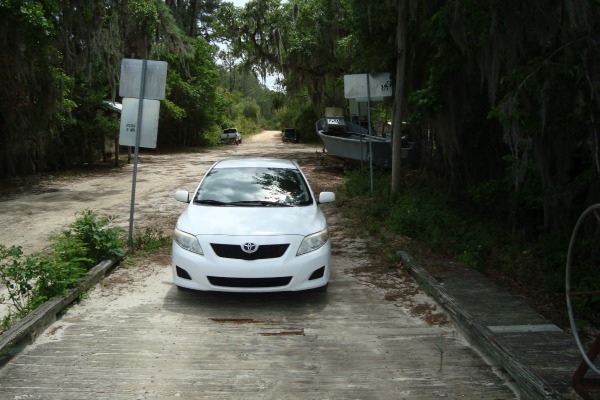 The historic Fort Gates Ferry carries cars, pickup trucks, motorcycles, bikes and their passengers across the St Johns River. Fort Gates, on the eastern edge of the Ocala National Forest near Salt Springs, was an army stockade during the Second Seminole war (1835-1842). 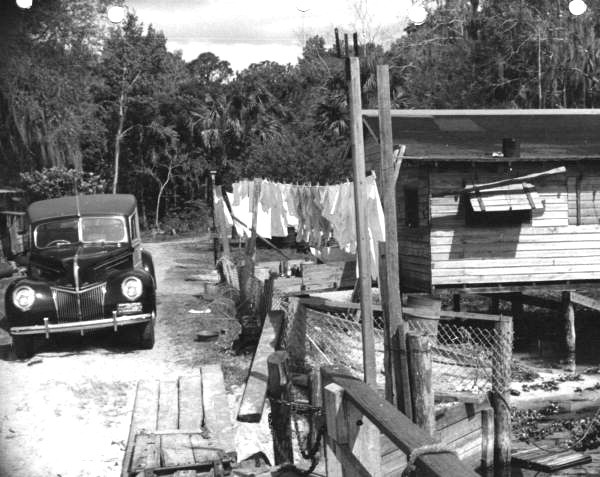 The ferry's eastern terminus is Gateway Fish Camp near Fruitland Cove, and its western landing is in the Ocala National Forest at the end of FR-29 (Forest Service Road) probably near where the old Seminole War stockade was located. 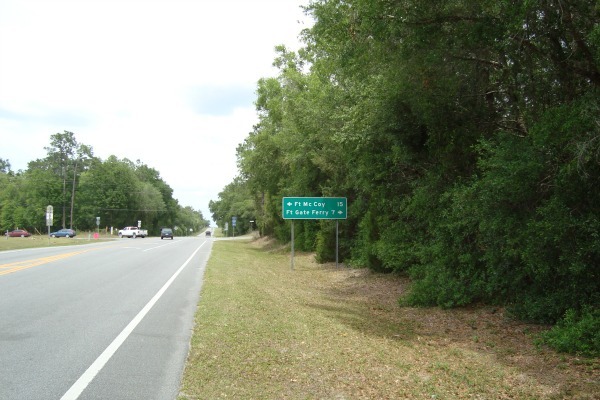 The ferry route is part of the "Florida Black Bear Scenic Highway", a national scenic byway that meanders over this part of Florida. This ferry saves some motorists who live near either side of the ferry route almost 50 miles of driving if they want to go from one side to the other. Without the ferry they would go north to Palatka and across the Memorial Bridge there, or down to Astor and cross that bridge. 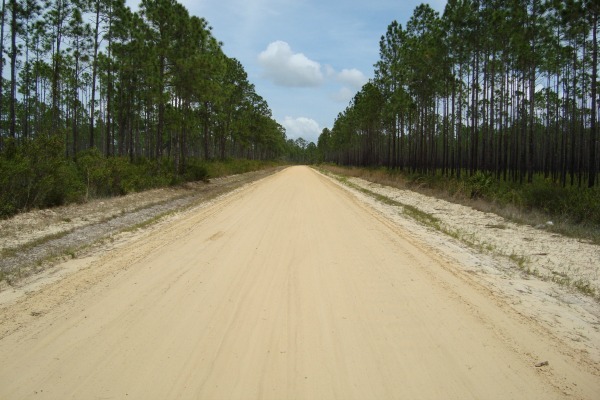 On April 15, 2017, I drove the sandy clay washboard Forest Service road from SR-19 at Salt Springs 7 miles east to the ferry landing on the St Johns River. The drive took me one hour because I chose to drive slow on the rough washboard road. Even so, my little Toyota Corolla shook and shuddered like a cold wet dog during the entire drive. Locals later told me that the best way to drive on a road like this is 60 or 70 miles per hour because the tires only make contact with the higher ridges and result in a much smoother ride. Next time I will try that technique. When I got to the end of the long torturous road, an official sign greeted me that made my heart drop. I was quite peeved to have made the bumpy trip for nothing. I noticed a man chopping brush from the edge of the road near the ferry landing and asked him about the status of the ferry. 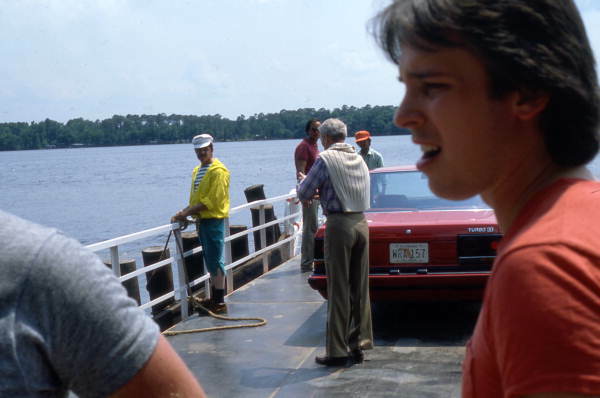 His name was Dale Jones and he was the ferry captain (and I later learned, the owner). He said the ferry had been closed since January 11 due to the low water level in the river and I would be his first passenger since then. He put duct tape over the "Closed" part of the sign and first carried his own pickup across the river. About 20 minutes later he was back on my side and I drove my car onto the 40 foot long barge. His push boat is a 21 foot sailboat hull made in Welaka in 1910 and powered by a late model Isuzu diesel engine. The push boat is named "Too Wendy" and in its original sailboat form was known as a"Sharpie". He lashes it alongside the barge and it powers the barge across the river. The old steel barge can hold two cars or pickups and was built in 1946. It can handle up to twenty motorcycles and double riders, and even more bicycles. The Fort Gates Ferry has been operating since 1853 and is the oldest ferry service of the four still operating in Florida. During the Civil War it was operated by the Confederate Army. 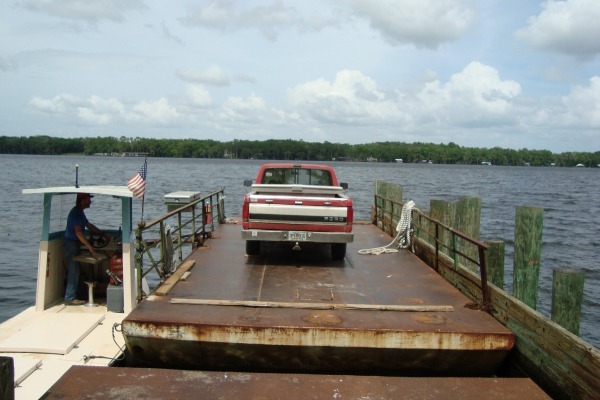 The modern version of the ferry (with a pusher boat and barge) began operating in 1914 and is privately owned and operated by the Gateway Fish Camp with a subsidy from Putnam County, Florida. Modern Floridians may remember a 1982 commercial for the Nissan Skyline filmed on the ferry and featuring Paul Newman, who used to race cars for Nissan. The ferry operates every day from 800 am to 530 pm except Tuesday. It is estimated that about 1,500 vehicles use the ferry each year. It takes ten minutes to cross the one mile wide St Johns River. The time honored way to signal the ferry (if you are on the forest side and the ferry is at the fish camp) is to drive your car up close to the ramp and turn on your headlights. You will soon see the ferry heading your way. Another way is to call the Gateway Fish Camp at 386-467-2411. The headlight method is the best.